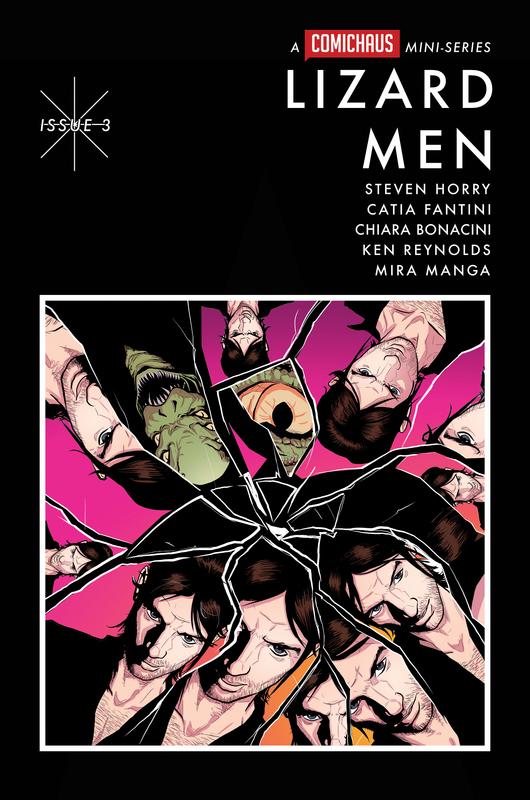 Lizard Men by Steven Horry has already impressed with its first two issues and with the third issue hitting Kickstarter, it seemed like the right time to grill him about what’s happened so far & what he has planned for the remainder of the 6-issue run. Is Lizard Men a title you’ve had in mind for a while? Yeah – the idea started forming during the 2015 election campaign. I’d been obsessively watching the news coverage whilst reading a lot of illuminati conspiracy theory guff, and then Russell Brand had started making proclamations about politics via YouTube, Facebook and Twitter. He was part of a panel on – I think – Newsnight and an MP challenged him: “Why don’t you stand then?” I was kind of amused by this idea and then my brain went wandering. Thanks to all the stuff I’d just read, the answer to the question “What would happen if he did stand?” was automatically answered with “The lizards will expect him to do what he’s told.” And it kind of snowballed from there. Though as I said in one of the commentaries we’ve done for the issues so far, though: Dylan is absolutely not Russell Brand. He’s a Damon Albarn/Noel Gallagher hybrid. Brand’s way of speaking is very, very flowery and verbose, which isn’t quite what I needed for this story. Dylan is more blunt and direct. Having loved those first two issues what can we expect in the next issue? A page (18 to be specific) that I thought was really funny but Ken Reynolds (our letterer) described as “disturbing”! A visit to Buckingham Palace, the most ridiculous cliffhanger I’ve ever written – I was cackling when I wrote it – an unexpected reaction, fake memories, a rescue and a supporting character getting a bit bold. And our first double page spread, which is a wonderful piece of work by Catia and Chiara. The world you’ve created could appear pretty messed up if it wasn’t for the chaos in the current political climate but do you think this helps or hinders the Lizard Men? On a day like today, with resignations on all sides and insanely addictive rolling news it’s a massive hinderance! But on the plus side, it makes the central idea more believable. Well, the bit about a rock singer becoming Prime Minister, anyway! In 2016/17 I genuinely worried that real life was racing past what I was thinking up. I panicked when Kanye West and Kid Rock started talking about running for office in the wake of Trump, ‘cos if they had, the whole game would have been up. Though that turned out to be a good thing, ‘cos it kicked me up the backside to just get the thing finished and out. Having insane real-life events that can be fed in is great on one level, but whilst Lizard Men has its ridiculous moments, it’s nowhere near as ridiculous as real life. 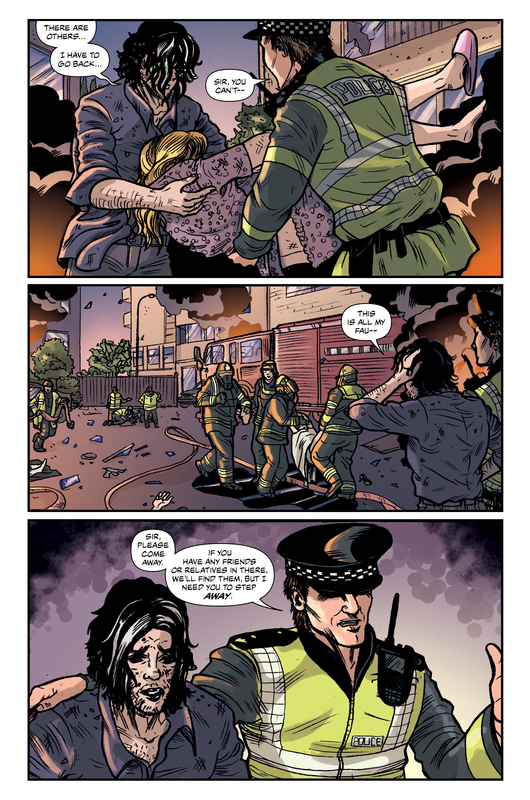 It’s also helpful that real life is constantly creating a huge well of things to call on for reference – for example, in issue 1 a crowd are singing “Oh, Dylan Zamani” in “Oh, Jeremy Corbyn” style. Though there’s so much of it I have to be careful not to let it crowd out the story. It has to support the narrative and not overwhelm it, but something like that is great for a shorthand to get across how people feel about Dylan. How did the creative team come together? Mira (editor) and I have known each other for years, through bands and mutual friends. I think the first time we properly met was being paired up by my old label bosses to sing some covers at a party. There is video, and it is AWFUL. Fun, but awful. We’ve done a couple of musical things since, and she’s a writer in her own right and a super-positive person, so it became obvious very quickly she was the right person to get involved as editor. I found Catia’s art desperately Googling for an artist for Chalk (our Comichaus anthology series) with the deadline looming after the original artist dropped out. I loved her stuff, Pete got in contact and she’s been amazing ever since. We built up a good rapport and she’s so fast and GOOD that she seemed a shoe-in for this. I was going to draw Lizard Men myself at one point, but I’m glad I didn’t ‘cos Catia draws Dylan much, much sexier than I do. Chiara is friends with Catia and their styles mesh really well, and then finally Ken came along through his sterling work lettering Chalk for Comichaus. Pete gave me a choice of letterers and Ken’s work really stood out. Ken – also being much more experienced in Kickstarters than I – has kept me sane throughout the whole process. All of them are awesome. We’ll actually all be together for the first time in real life in September at Thought Bubble, which I’m massively looking forward to. 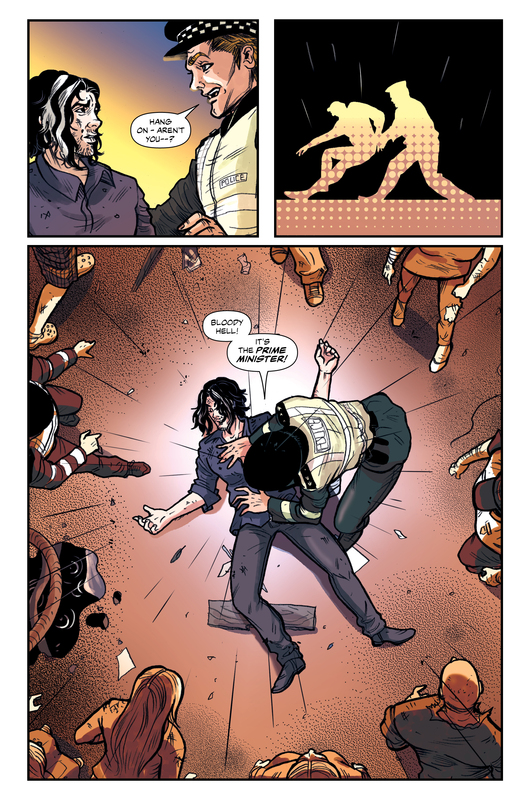 What’s it been like working with Comichaus to release the book? Working with Comichaus is an absolute joy. The last couple of years writing Chalk and Lizard Men and working with Comichaus has been one of my absolute favourite creative experiences. The book probably wouldn’t be happening in this form if not for Pete Genepool, to be honest. He’s been super-supportive from the first time I mentioned the idea. 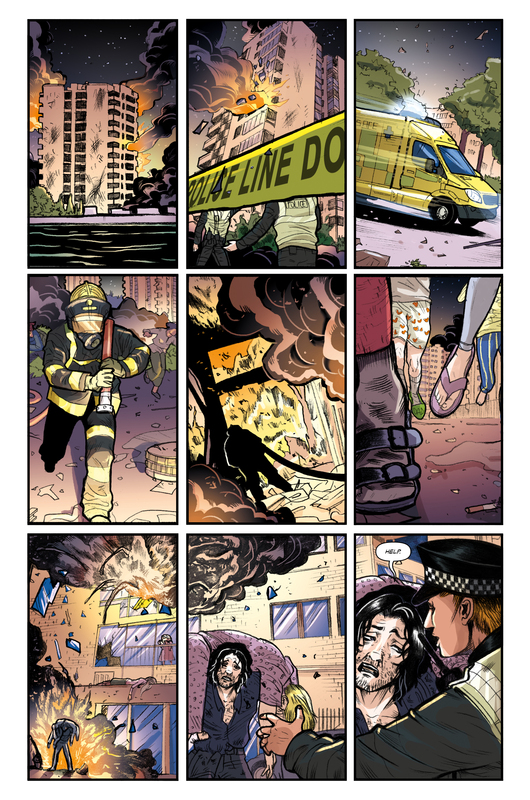 I think what Pete is doing with Comichaus in general – the app, the anthology books – is really, really cool. What can we expect from the second half of the 6-issue series? Do you see more of the series beyond this first run? If there’s demand, I definitely have ideas for a second series. There’s SO much of this stuff to draw upon. I did a stack of research on all sorts of crazy theories, so there’s loads of material I’d like to use but haven’t had the right place to fit it in. Even today I came across a conspiracy theory about dinosaur fossils as fakes planted by Satan to test the faith of Christians. Which is clearly amazing. And a friend lent me a book about cat people from Sirius. I really really really want to introduce the cat people from Sirius. Catia and I are finishing our Comichaus anthology serial Chalk as a graphic novel. It’s a melting pot of British mythology, in which an immortal woman, the Devil and Herne The Hunter do battle with an uppity demon. With flirting. Lots and lots of flirting. It’ll basically expand on the material so far, and then we’ve got origins and conclusions and sidesteps and all sorts. I read the bits we’ve published so far recently and quite like how it works as short episodic chapters, so the remainder of the book will follow that structure. I’m also working on the first issue of something else that’s been brewing in my head for a while in collaboration with another writer. It started – I poop ye not – with a BBC4 documentary I saw a while back about the utopian thinking behind the early days of Milton Keynes. Once that’s a bit further down the line the search for an artist will be on and we’ll start hawking it around. Then in September it’s Thought Bubble, followed by a gig with my musical collaborator Mark Fernyhough opening for Suede in Berlin. I’ve got to finish mixing the single we’ll be releasing to coincide with that show and start rehearsing, I guess! Find out what’s next for Lizard Men over on the titles Facebook page. Keep an eye out on the Comichaus website & app for the previous and future issues. This entry was posted in Interviews and tagged Catia Fantini, Chiara Bonacini, ComicHaus, Ken Reynolds, Kickstarter, Lizard Men, Mira Manga, Steven Horry by G-Man. Bookmark the permalink.